Relapsing-remitting MS —Symptoms suddenly reappear periodically. They last for a few weeks or months, then go back into remission (a period with no symptoms). Symptoms may get worse with each occurrence. Kang JH, Sheu JJ, Kao S, Lin HC. Increased risk of multiple sclerosis following herpes zoster: a nationwide, population-based study. J Infect Dis. 2011;204(2):188-192. Multiple sclerosis. EBSCO DynaMed Plus website. Available at: http://www.dynamed.com/topics/dmp~AN~T116285/Multiple-sclerosis-MS . Updated June 21, 2017. Accessed October 2, 2017. 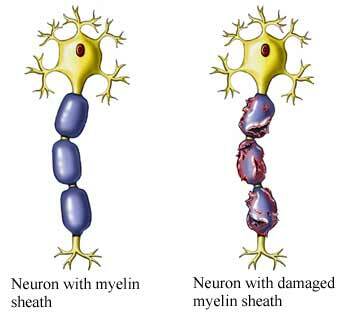 NINDS multiple sclerosis information page. National Institute of Neurological Disorders and Stroke website. Available at: https://www.ninds.nih.gov/Disorders/All-Disorders/Multiple-Sclerosis-Information-Page. Accessed October 2, 2017. Treating MS. National Multiple Sclerosis Society. Available at http://www.nationalmssociety.org/Treating-MS. Accessed October 2, 2017. What is MS? National Multiple Sclerosis Society website. Available at: http://www.nationalmssociety.org/What-is-MS. Accessed October 2, 2017. 1/4/2011 DynaMed Plus Systematic Literature Surveillance http://www.dynamed.com/topics/dmp~AN~T116285/Multiple-sclerosis-MS : Healy B, Ali E, Guttmann C, et al. Smoking and disease progression in multiple sclerosis. Arch Neurol. 2009;66(7):858-864. 4/25/2014 DynaMed Plus Systematic Literature Surveillance http://www.dynamed.com/topics/dmp~AN~T905969/Treatment-of-specific-impairments-in-multiple-sclerosis : Rosti-Otajärvi EM, Hämäläinen PI. Neuropsychological rehabilitation for multiple sclerosis. Cochrane Database Syst Rev. 2014;2:CD009131. 4/25/2014 DynaMed Plus Systematic Literature Surveillance http://www.dynamed.com/topics/dmp~AN~T116285/Multiple-sclerosis-MS : Yadav V, Bever C Jr, Bowen J, et al. Summary of evidence-based guideline: Complementary and alternative medicine in multiple sclerosis: Report of the Guideline Development Subcommittee of the American Academy of Neurology. Neurology. 2014;82(12):1083-1092. 11/9/2015 DynaMed Plus Systematic Literature Surveillance http://www.dynamed.com/topics/dmp~AN~T116285/Multiple-sclerosis-MS : Kuo CF, Grainge MJ, Valdes AM, et al. Familial aggregation of systemic lupus erythematosus and coaggregation of autoimmune diseases in affected families. JAMA Intern Med. 2015;175(9):1518-1526.